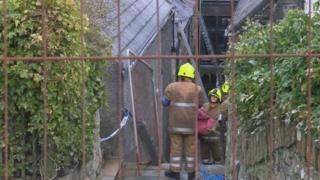 One person has died after fire broke out at a house in Shetland. Emergency services had been called to the house in Burns Lane, Lerwick, at 23:59 on Saturday. Four fire engines attended - two from Lerwick, one from Sandwick and one from Bixter - and the crews successfully put out the blaze in the two-storey building. No details of the person who died have been released. Police have thanked "brave" members of the public who tried to save a person who died. Ch Insp Lindsay Tulloch said: "I know that some members of the public tried their best at the scene to save the person involved and I would like to thank you for your brave efforts. "Inquiries are ongoing in conjunction with the Scottish Fire and Rescue Service into the cause. "Our thoughts are with all those affected by this tragic incident."